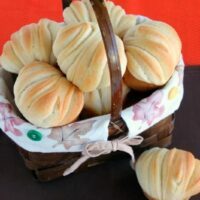 Butterflake Dinner Rolls - Dessert Now, Dinner Later! When I was in college I interned at a local grocery store bakery. It was the first bakery I had ever been in & I did a lot. I got to try everything from donuts, to rolls, to decorating cakes. It was a fun job! It was also the place that I met the best baker in the world, my friend Jason! And guess what? Today is his birthday! Happy Birthday Jason! 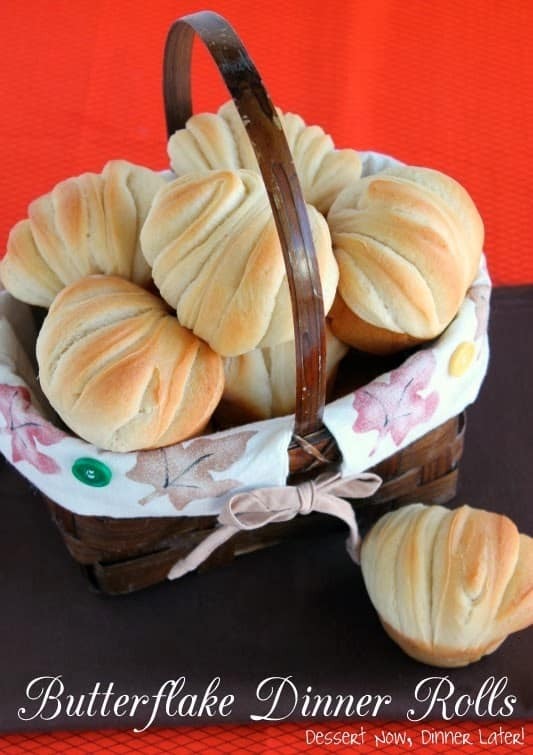 To celebrate, I am sharing this beautiful butterflake dinner rolls recipe with you today. It’s layered with butter & peels apart into tender, flakey pieces of roll. This is the PERFECT Thanksgiving roll to impress your family with this year. 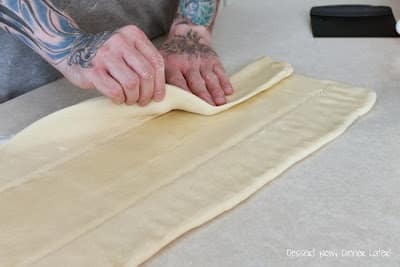 You don’t have to be a pro-baker to make these either, because I have the best of the best teaching us step-by-step how to make this beautiful roll. There are also a couple of variations at the bottom for an orange or raspberry sweet butterflake roll, & a savory garlic butterflake roll too. You are going to fall in love with these! This recipe makes 2 1/2 dozen, so you might have a couple left over for those turkey sandwiches after Thanksgiving day. Have fun with it! Enjoy! And thanks to Jason, for being my helper on this post! Keep scrolling to the very end for the recipe. Once the dough is made, take the dough out of the bowl & place it on a lightly floured surface. 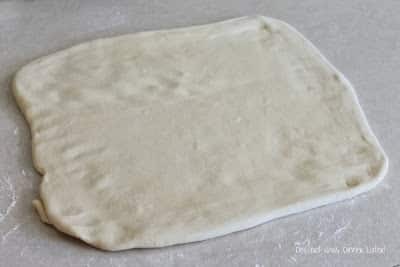 Shape the dough into a square, cover with a towel & let it rest for 10 minutes. 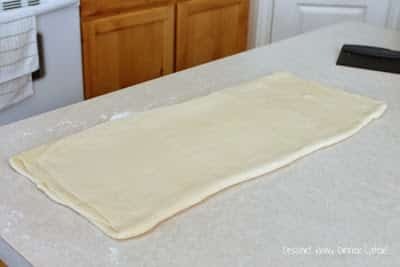 Flatten dough with a rolling pin into about 1/2″ thick square. Then the buttered side on top of that. 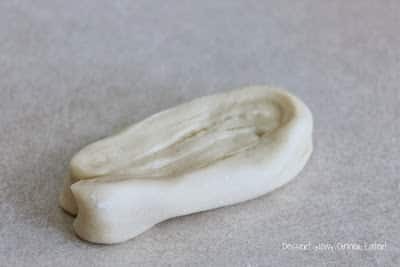 Place dough on a baking sheet in the freezer for 20 minutes. Once the butter has had time to chill inside the dough, flatten again long ways to about 1/4″ thick. Then brush melted butter on the center half of the dough. 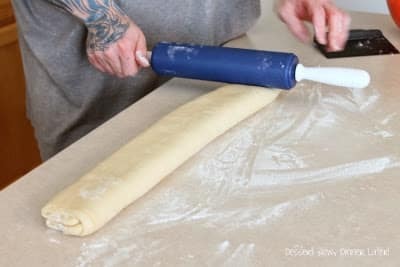 Flatten gently with the rolling pin. …& then fold the top half over. You won’t use all the butter. Save the rest for brushing the hot rolls when they come out of the oven. 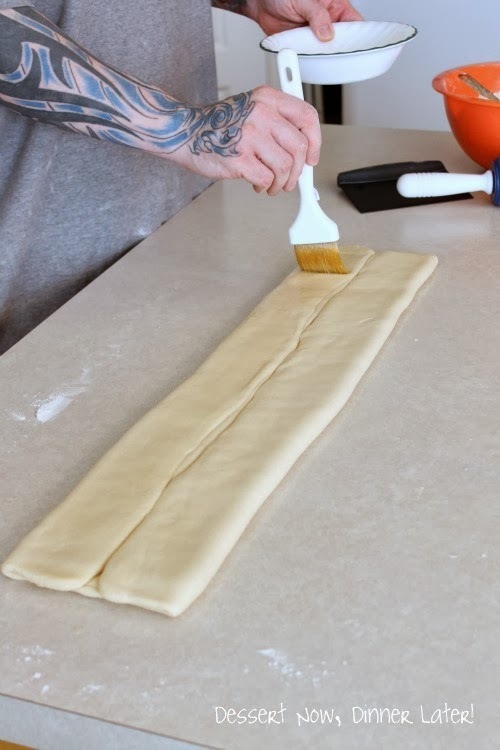 Use a rolling pin & flatten the strip of dough to roughly 1″ thick & about 3 inches wide. Cut 1/2″ to 3/4″ thick pieces. Take each piece & lay flat on the table. Roll them from the top down. 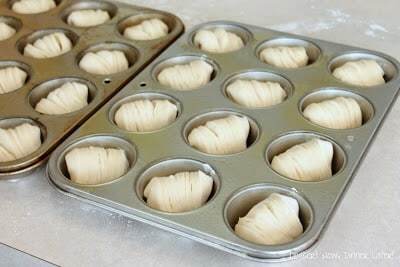 Put rolls into sprayed muffin pans with the seam side down. Cover the pans with plastic wrap that has been lightly greased with pan spray. Let rise until the rolls are a good 1/2 inch over the top of the muffin pans, about 1 hour. Bake at 350˚F for 15 minutes. 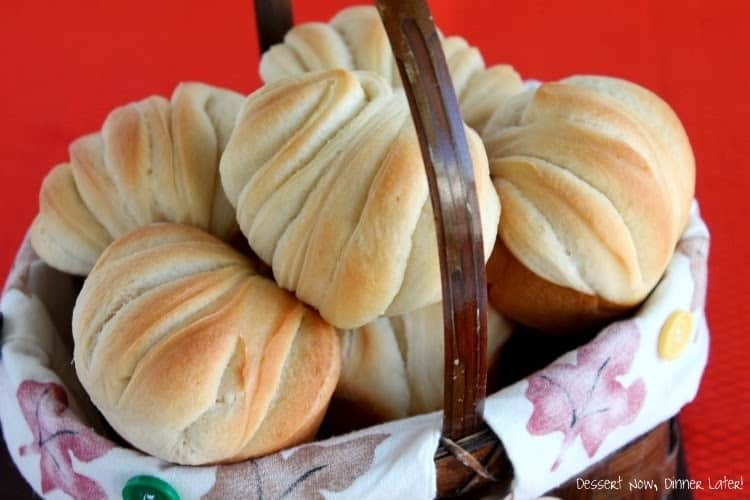 Brush the hot rolls with the remaining melted butter hot from the oven. Place all the ingredients but the butter into a stand mixer with the hook attachment. Mix on medium speed for about 20-25 minutes or until the dough balls up & pulls completely away from the bowl (the bowl comes clean.) It will look sticky for a while, so be patient with it, you don't want to add a bunch of flour & dry it out. Take the dough out of the bowl & place it on a lightly floured surface. 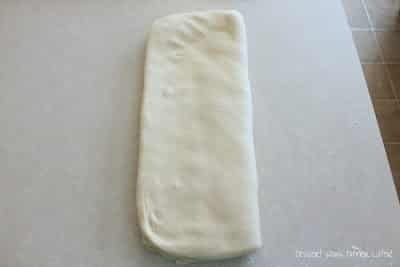 Shape the dough into a square, cover with a towel & let it rest for 10 minutes. 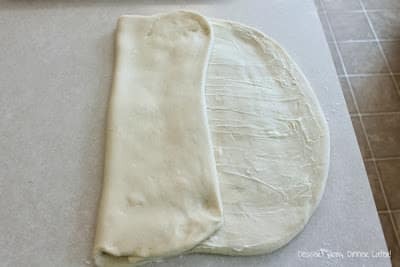 Flatten dough with a rolling pin into about ½" thick square. Spread SOFTENED butter on ⅔ of the square. Do a tri-fold by folding the non-buttered side over first, then the buttered side on top of that. 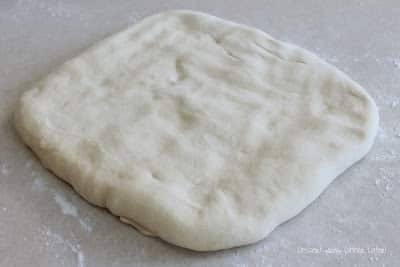 Place dough on a baking sheet in the freezer for 20 minutes. Once the butter has had time to chill inside the dough, flatten again long ways to about ¼" thick. Then brush melted butter on the center half of the dough. 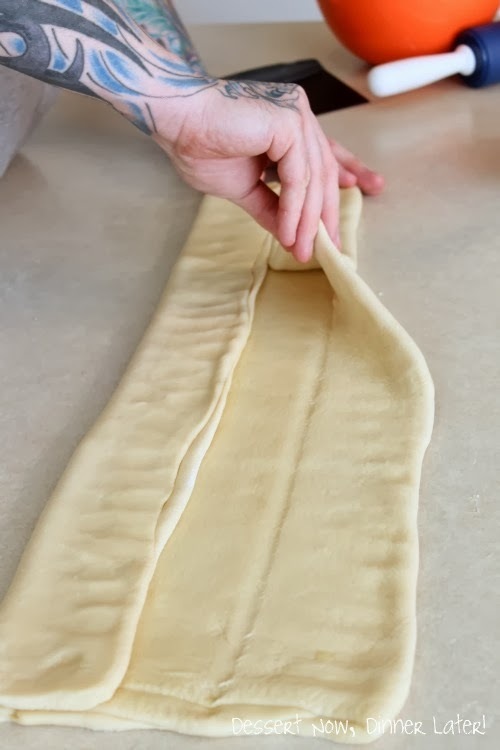 Fold the bottom fourth of the dough up, & the top fourth of the dough down so the two ends meet in the middle (book fold.) Flatten gently with the rolling pin. Brush melted butter on the bottom half of the fold & then fold the top half over. You won't use all the butter. Save the rest for brushing the hot rolls when they come out of the oven. 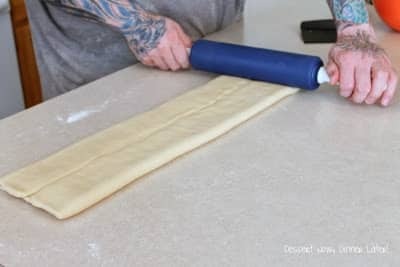 Use a rolling pin & just flatten the strip of dough to roughly 1" thick & about 3 inches wide. 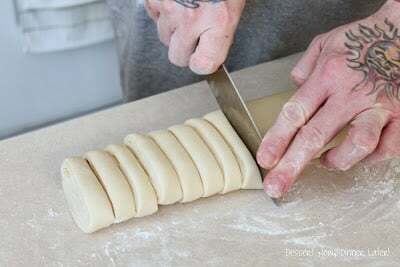 Cut ½" to ¾" thick pieces. Take each piece, lay it flat on the table, & roll them from the top down. Put rolls into sprayed muffin pans. Cover the pans with plastic wrap that has been lightly greased with pan spray. Let rise until the rolls are a good ½ inch over the top of the muffin pans, about 1½ to 2 hours. Bake at 350*F for 13-15 minutes. Brush the hot rolls with the remaining melted butter hot from the oven. Makes 2½ dozen. *Variations: Use orange marmalade or raspberry preserves on top of a THIN layer of softened butter in step #4 for an orange or raspberry roll. Complete other steps as written. Allow rolls to cool. Combine powdered sugar mixed with a tiny bit of water to create an icing. The less water you use the thicker the glaze will be. Flavor the glaze with orange marmalade or raspberry preserves & dip the tops of the rolls in the glaze; allow glaze to dry. Make Garlic Butterflake Rolls by sprinkling garlic salt on top of the butter in step #4. Complete other steps as written. Brush hot rolls with butter & an extra sprinkle of garlic salt & even grated parmesan cheese if desired. Wow is all i can say! These are absolutely beautiful!! 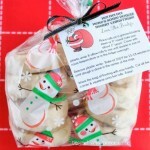 I think I need to make these very soon!! A little time consuming but I think its all worth it! 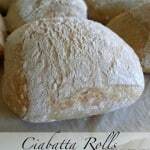 Yeah these are rolls to impress, so they do take more time, but are definitely worth it! OH wow these look beautiful and delicious. I absolutely love those flakey orange rolls but these sound so good as regular rolls too. Love your step by step photos and can’t wait to try these! These looks FABULOUS!!! Oh my! It was fun seeing how they came together, thanks for the ste-by-step photos. What great things you must have learned at that bakery. I bet it was so wonderful! These look so perfect and beautiful! Great job. These look so yummy. My kids would love them because they are different. These look beautiful and delicious! Yum! 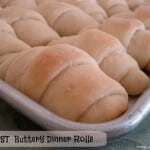 There isn’t anything much better than a buttery, flaky roll! These look amazing! I will have to have my daughter make these for me, since yeast hates me. They are beautiful and look fantastic. Mmmmm butter and bread, love it all, and I love the way it looks when it’s finished! I tried to make these. I don’t have a stand mixer yet so tried to mix by hand. This may be where my problems started.. Never had a problem with the dough being sticky; mine was very crumbly. I added a tablespoon of water to make it hold together better. My dough never got all smooth like yours, and when I was rolling it, it cracked a lot instead of stretching. I kept at it though. Eventually I got it all folded, buttered, cut and rolled; but it never rose. They came out of the oven looking like they did when they went in. Help?! Hi Candace, so sorry you are having problems. This dough really needs that time in the mixer to develop the gluten (makes the dough stretchy.) Did you weigh your ingredients or measure them? Whenever you measure flour, it needs to be stirred up first so that you incorporate some air into it, that way your bread won’t be dried out or dense. Did you let the rolls rise before you put them in the oven. It takes a good hour for them to rise since the dough was just in the freezer for that first layer of butter. Also how warm was the water that you used? If it was too cold, it might not have activated the yeast, if it was too hot, it might have killed the yeast. I hope some of this information helps. Let me know if you have any more questions. Thank you for the reply Amber, next time I will try using a friend’s mixer. That may have been the problem. Also I measured my flour, I may try weighing next time. I gave them over an hour to rise. The water was warm when I added it, but maybe by the time I added all the other ingredients (including the yeast) it may have cooled. Especially since it is one of the first listed, with the eggs (which came from the fridge). Yeah, go ahead & try a little bit warmer water next time & with the mixer you should be just fine. If you can weigh all the ingredients that is ideal, but do what you can. I measured everything after I weighed it for approximate measurements as stated in the recipe. You are a brave woman to try & tackle all that dough by hand. 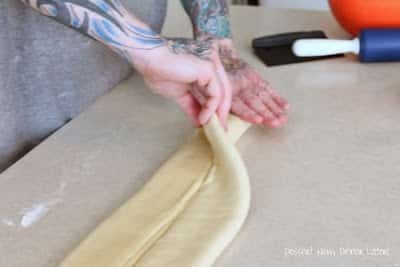 My arms would be exhausted trying to knead all that dough! Hi Ghislaine! You can substitute the powder with milk. The powder gives it a little extra sweetness & softness, but regular milk will still add that softness to the dough. Just add a little bit more flour, just be careful not to dry the dough out. It doesn’t pull away from the sides of the mixer until the end of the 20-ish minutes of kneading time. Best wishes! Thank you Amber – can’t wait to try them! Would you substitute equal amounts for the powder and liquid milk? Ok – last question I promise!! Step 1 says to put all ingredients in mixer – does this include the softened and melted butter? Or is the 1/4 cup of each listed meant just for the brushing on the dough later? Everything but the butter. Sorry, I will fix the directions! So do you mix the dry yeast in with all the other ingredients without mixing it with water first? Thank you! 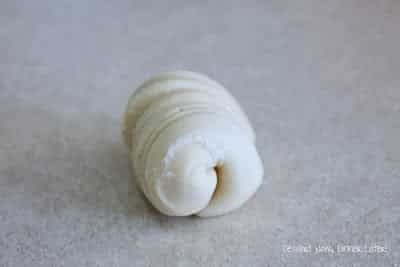 Has anyone tried using a bread machine on the dough cycle for the dough? You should be able to use it. It just needs to work long enough to develop the dough. Possibly add a little bit more flour, so the dough is slightly stiffer. I have never made dinner rolls from scratch. Would it be a disaster to let it sit for longer than an hour before baking? Wondering if I could do everything at home and bring them to my mom’s to bake right before eating. Thanks! They should be fine. If they are getting really big, just put them in the fridge to stunt the growth until you take them to be baked. Best of luck! 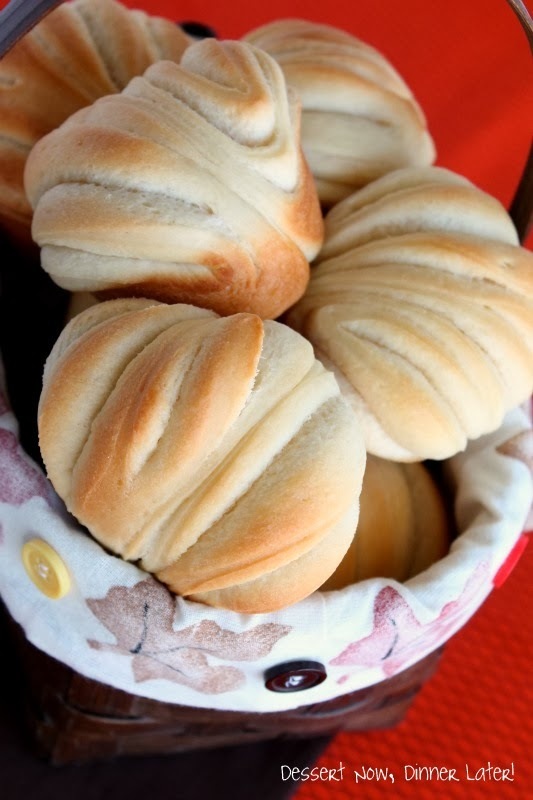 I am doing these for thanksgiving, in-laws are coming by a(first time), so I am going to impress them with you rolls….they are awesome! Thank you for posting this wonderful recipe! It was a hit! I loved them, my family loved them! Only thing I changed was the flour- wheat flour, the butter- Smart Balance, Eggs- Egg beater! Oh and I found you on Pinterest,com while looking for this kind of recipe! Yay!!! Thanks for coming back to let me know how it went! I am glad to know that it worked with all of your substitutions! I have never made them wheat before, but I like that idea! Thanks again for letting me know of your success!!! What a creative recipe! It’s always great to see a new take on dinner rolls 🙂 I would love to make them, but was wondering if the recipe can be halved, or even quartered for a smaller quantity? Thanks! Sure thing! 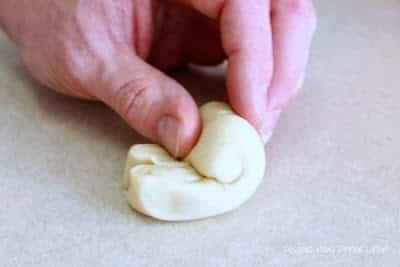 I probably wouldn’t quarter it b/c you need enough dough in your mixer to knead it properly for the 25 minutes, but halving it should be just fine. Could I possibly make the dough the day before and just keep in the fridge until ready to bake or will that mess up the yeast and rising etc? Has anyone ever done that with this recipe? You can definitely keep the dough in the fridge until you are ready. 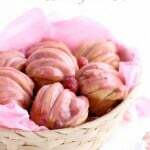 You can even get them in the muffin tins & cover them & refrigerate overnight. Refrigeration will slow the rising process, but as soon as they get to room temperature they will rise like normal. 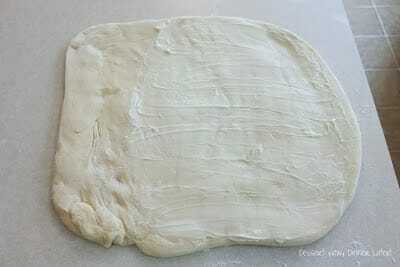 The refrigerating is not going to effect the dough, just keep it covered well so it doesn’t dry out. Best wishes! Great news! Thanks so much for taking the time to reply. I’m excited to make these! Could these be made up to the point where you would have them ready to rise, but freeze instead? Then place frozen rolls in muffin tins to allow to rise and then bake? You could definitely try it, I don’t see why not. I might do 1.5x or 2x the yeast though, so that it helps it rise better after it’s been stagnant in the freezer. My dough looked great when I formed the square but did not rise after I put them in the muffin tins. Maybe my water wasn’t the right temperature. It was between 110 and 120. I’m so sorry they didn’t rise. I like to have my water closer to 120- 130 degrees Fahrenheit. Is your yeast old? That’s the only other thing I can think of. Could you make these the night before and bake them the next day? 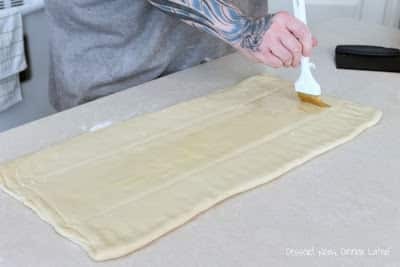 Yes, just cover them with plastic wrap that’s been greased with baking spray, and when you wake up, put them in a nice warm place to rise for a couple of hours. Where do you get your milk powder? Hi Nancy! I get mine in bulk for food storage, but any powdered milk will work fine. They have it in the baking aisle of the store next to the canned milks. Can you use active dry yeast instead of instant? Yes! That would be just fine.